I’ve just finished (of course, just under the wire) photographing this month’s Daring Bakers challenge which was “Dorie’s Perfect Party cake” from Dorie Greenspan’s Baking: From My Home to Yours. Some challenges are about technique, others about presentation. This cake falls into the latter category. There was nothing new or challenging about the cake except if you’ve never made a Swiss meringue buttercream. Swiss meringue buttercream is my favorite frosting: it is far superior to the confectioner’s sugar and milk concoction that too often is used to frost cakes and cupcakes. What I loved about this challenge is the specifics of decorating and frosting were left up to us, although I chose to adhere to the lemon flavored frosting and cake, filling of buttecream and raspberry preserves, and coating of coconut flakes. That sounded like a winning combination to me and I saw no reason to fiddle. What I did do, however, was make individual layer cakes instead of one large one, thinking that they’d be easier to share and consume over time. I used a half sheet pan to bake the cake in, and a round cookie cutter to cut circular disks that I used as the layers. After making four little 3-layer 3-inch diameter cakes, I used the remaining cake to make a dainty rectangular version. I topped each with raspberries brushed with egg white and rolled in dusting sugar. I don’t know how to wax more enthusiastic about this cake except to say that it was absolutely divine. It turned out an elegant pure white cake with a moist, delicate crumb. The lemon flavoring was subtle and a perfect complement to the raspberry. The buttercream was perfect. It was the first time I ever added lemon juice to buttercream and was so suspicious of how it would absorb ¼ cup of liquid that I almost skipped it, but it worked perfectly and I’m glad I stuck to the recipe as written. This is indeed the perfect party cake – I will keep this recipe on hand and use it again. Thanks for the challenge and the recipe! Sift together the flour, baking powder and salt.Whisk together the milk and egg whites in a medium bowl. Put the sugar and lemon zest in a mixer bowl or another large bowl and rub them together with your fingers until the sugar is moist and fragrant. Add the butter and working with the paddle or whisk attachment, or with a hand mixer, beat at medium speed for a full 3 minutes, until the butter and sugar are very light. Beat in the extract, then add one third of the flour mixture, still beating on medium speed. Beat in half of the milk-egg mixture, then beat in half of the remaining dry ingredients until incorporated. Add the rest of the milk and eggs beating until the batter is homogeneous, then add the last of the dry ingredients. Finally, give the batter a good 2- minute beating to ensure that it is thoroughly mixed and well aerated. Divide the batter between the two pans and smooth the tops with a rubber spatula. Put the sugar and egg whites in a mixer bowl or another large heatproof bowl, fit the bowl over a plan of simmering water and whisk constantly, keeping the mixture over the heat, until it feels hot to the touch, about 3 minutes. The sugar should be dissolved, and the mixture will look like shiny marshmallow cream. Remove the bowl from the heat. Working with the whisk attachment or with a hand mixer, beat the meringue on medium speed until it is cool, about 5 minutes. Switch to the paddle attachment if you have one, and add the butter a stick at a time, beating until smooth. Once all the butter is in, beat in the buttercream on medium-high speed until it is thick and very smooth, 6-10 minutes. During this time the buttercream may curdle or separate – just keep beating and it will come together again. On medium speed, gradually beat in the lemon juice, waiting until each addition is absorbed before adding more, and then the vanilla. 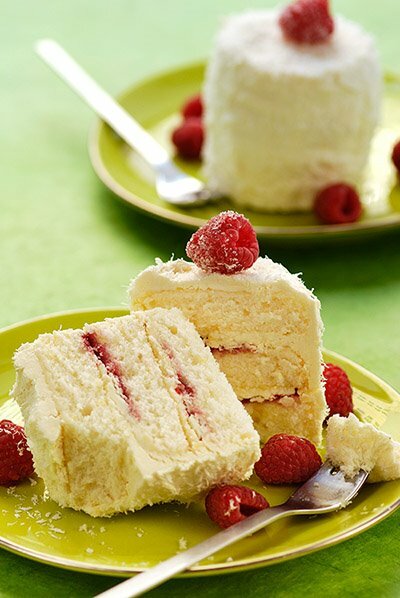 You should have a shiny smooth, velvety, pristine white buttercream. Press a piece of plastic against the surface of the buttercream and set aside briefly. Using a sharp serrated knife and a gentle sawing motion, slice each layer horizontally in half. 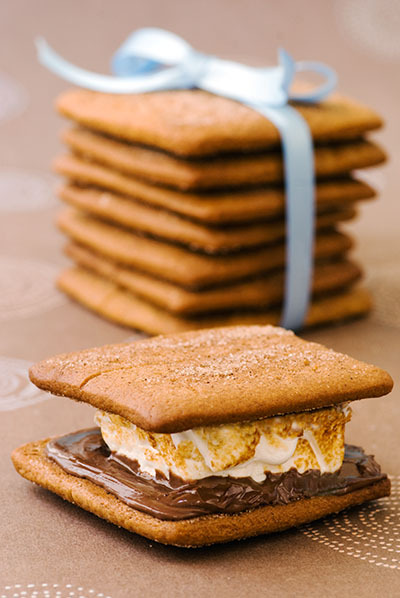 Put one layer cut side up on a cardboard cake round or a cake plate protected by strips of wax or parchment paper. Spread it with one third of the preserves. Cover the jam evenly with about one quarter of the buttercream. Top with another layer, spread with preserves and buttercream and then do the same with a third layer (you’ll have used all the jam and have buttercream leftover). Place the last layer cut side down on top of the cake and use the remaining buttercream to frost the sides and top. Press the coconut into the frosting, patting it gently all over the sides and top. Since lemon is such a friendly flavor, feel free to make changes in the preserves: other red preserves – cherry or strawberry – look especially nice, but you can even use plum or blueberry jam. I took an extended absence from the farmer’s market. Partly I was lazy about getting over there on Saturday, partly I was tired of the same old cold weather offerings and small number of stands typical of the deep winter. I was excited anew to check out the offerings last weekend since spring is now in the air, and I was sure there would be the first signs of a new crop hitting the market. To my delight, many of the stands that had been absent for so many months were back. There was a wealth of flowers: the first tulips, including the ones I love with pointed bi-color petals, and a variety of branches from peach blossom to magnolia (I missed out on the latter by 5 minutes – guess who will be there bright and early next weekend?). There were many root vegetables, which, of course, is not new news but I was attracted to some beautiful onions I hadn’t noticed before: large red and white pearl onions (much bigger than I had ever seen before but with their telltale oval shape) and large cipollini – red and white (have you ever seen red before?). 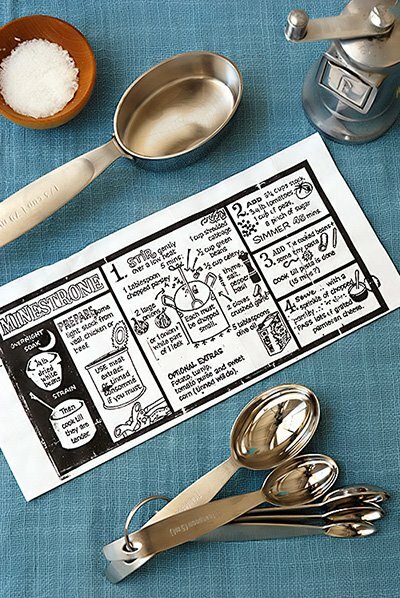 I was reminded of my favorite whole onion recipe that was featured in Martha Stewart Living’s Thanksgiving issue two years ago. For some reason, that particular issue was full of particularly inspiring recipes and ideas, much more so than the same issue last year. One of the many recipes I tried in that now dog-eared edition is one for pan-roasted balsamic onions. 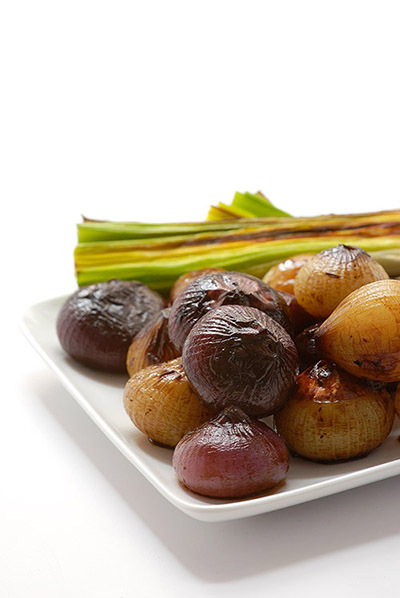 The recipe calls for mixed red and white cipollini and pearl onions as well as leeks. The leeks don't really work in Martha’s version – they wilt and discolor and become very unimpressive lump, so I have my own way of dealing with them, which I will share. 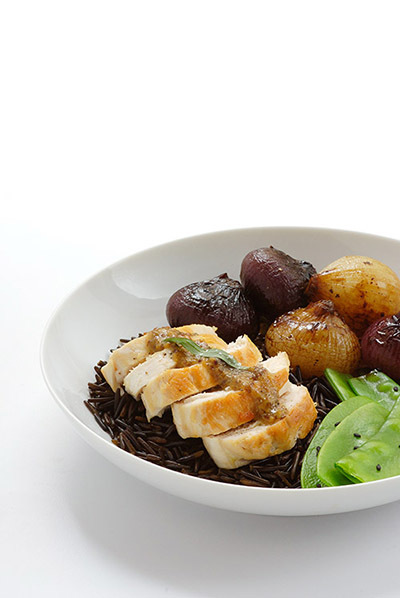 I prepared my bounty with some chicken, wild rice and snow peas. The onions are the show-stopper though – and I love that they are left whole so you can appreciate the beauty of their different shapes and colors. Bring a medium saucepan of water to a boil. Add white and red pearl and cipollini onions, and boil for 1 minute. Drain. Let stand until cool enough to handle, then carefully peel, removing roots but leaving the ends intact. Transfer to a large bowl, and add 2 tablespoons olive oil, 1 teaspoon salt, and 1/4 teaspoon pepper; toss to combine. Meanwhile, remove any damaged outer leaves from leeks (if using), then trim and discard dark-green tops. Cut them in half lengthwise, and swish in a bowl of cold water to rid them of dirt and sand, holding them so that the layers do not separate. Pat dry, and place on a roasting pan. Sprinkle with 1 tablespoon olive oil and 1/2 teaspoon salt. Broil leeks for 5-7 minutes until browned on top and softened. Meanwhile, add 1 tablespoon oil and white, red, and cipollini onions to skillet, and sauté turning occasionally, until browned all over, about 5 to 7 minutes. Reduce heat to medium low, and add balsamic vinegar and stock; cover skillet, and cook until onions are tender, 20 to 30 minutes. Add leeks cut-side down for last few minutes so that balsamic sauce coats them. Uncover, and add butter (if using); increase heat to high, and cook, shaking pan occasionally, until liquid reduces to a glaze and coats the onions, 3 to 4 minutes. Transfer to a serving dish. Season with salt and pepper if desired, and serve immediately. Add oil to a skillet (not non-stick) and heat. Season chicken with salt and pepper. Add chicken breasts and brown each side on medium heat. Add ¼ cup water, cover, and cook over medium-low heat until cooked through. Remove chicken from pan and reserve. Over low heat, add 3 tbs mustard and 6 tbs crème fraîche to pan and stir, scraping pan so that browned bits on bottom are released. Stir in 1 tablespoon roughly chopped tarragon leaves. Season with salt and pepper. Add additional crème fraîche if desired. Slice chicken and plate it. Spoon sauce over chicken. Garnish with a couple tarragon leaves. I have a wide range of cookbooks that serve different purposes. Some are around as coffee table books (for that day when I actually have a coffee table) that I bought mainly for the photography and format. Others are reference cookbooks that can be relied upon for simple instructions for basic recipes and formulas. Others are around to inject a little adventurous eating, among which are several authentic Chinese cookbooks. Others are reliable go-tos for quick but satisfying and imaginative dishes. A little unassuming cookbook that was given to me as a gift years ago is one of the latter. It has the very unexciting title of "On Rice" but it would be better described as "quick, clever, often one-pot, flavorful, diverse dinners that happen to include rice" (except that wouldn’t really be a catchy title, would it?). There are many recipes in it that have proven both delicious and reliable. 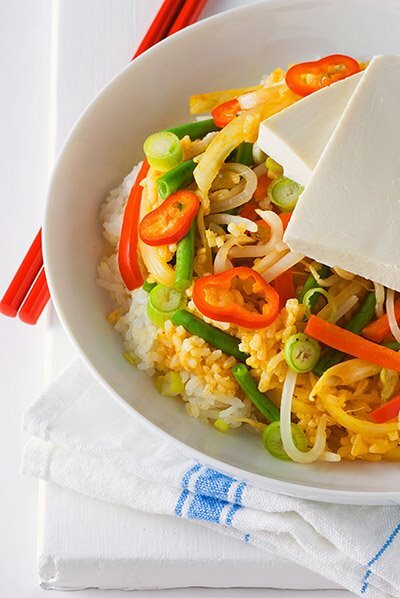 There’s a sushi rice bowl that’s full of different flavors and textures and is quick and inexpensive to whip up. There’s a chicken and asparagus with mustard-tarragon sauce that looks divine. One of my very favorites is a spicy Korean beef served over cabbage (and the requisite bed of rice). This recipe doesn’t even need the rice. It’s a hearty winter dish that’s full of flavor and most definitely a crowd pleaser. 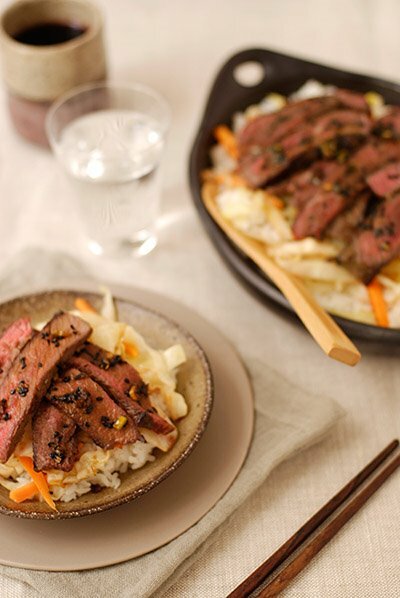 The beef marinates for an hour or more and picks up the very satisfying flavors of soy, scallion, garlic, hot pepper flakes, sesame oil and ginger. 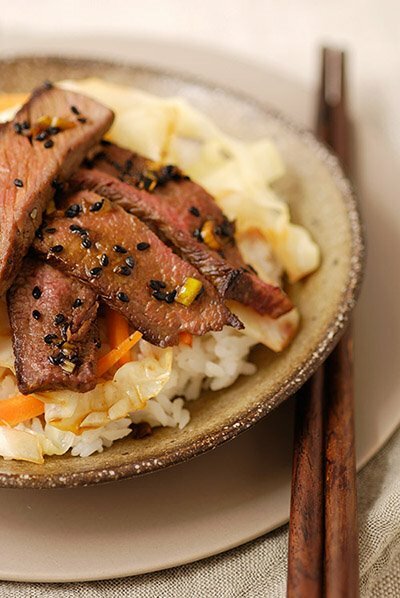 It broils in a few minutes and is sliced thinly over cabbage that is sautéed and combined with shaved carrots, a pinch of hot pepper and rice vinegar. It tastes impressive, but it’s truly simple and quick and requires a minimum amount of fresh grocery items and pots to clean. If you are like me and don't usually cook red meat because you aren't normally up for a heavy or complicated meat dish, this recipe is for you. A little unrelated reminder: if you are planning to submit a photo to DMBLGIT this month, tomorrow’s the deadline! P.S. The lead photo from my recent post "Red curry with tofu" was featured on TasteSpotting's weekly roundup of most popular posts to their site! (see top row, fourth photo from left). Yet another reason I love that site! To make marinade, heat a medium skillet over medium heat. Add the sesame seeds and cook, stirring almost constantly, until fragrant, about 3 minutes. Transfer to a plate to cool. In a mortar or on the work surface using a heavy skillet, coarsely crust the sesame seeds. Please in a large shallow dish. Add the remaining marinade ingredients and stir well to combine. Add the steak and rub some of the marinade ingredients over the top. Cover with plastic wrap and refrigerate for as long as possible, at least 1 hour or up to 8 hours. To make the spicy cabbage, core and cut crosswise into ½ inch strips. Heat a large (12-inch) nonstick skillet or wok over medium-high heat until hot. Add the oil, tilt the skillet to coat the bottom and heat until the oil is very hot. Add the scallions ginger and garlic and stir-fry until very fragrant, abut 30 seconds. Add the cabbage, chicken broth, carrots, salt and hot pepper. Cook, uncovered, stirring often until the cabbage stalks are translucent and crisp-tender, about 5 minutes. Stir in the vinegar. Remove from heat, cover, and keep warm. Position a broiler rack 6 inches from the source of heat and preheat the broiler. Remove the meat from the marinade, reserving the marinade. Broil the meat, turning once, until cooked to desired doneness, about 7 minutes from medium rare. Meanwhile, pour the marinade into a small saucepan and bring to a boil over low heat. Simmer for 2 minutes. Set aside. If necessary, reheat the cabbage. Cut the meat diagonally across the grain into ½-inch-thick slices. Spoon the rice into soup bowls. Top with the cabbage and then the sliced meat. Pour some of the marinade over each serving of meat and serve immediately. O.k., so hopefully that title made you laugh. But it's the truth. For the past two Christmases, my sister's mother-in-law, who is very lovely and generous, has sent me the most amazing little gifts a foodie would adore. Two years ago, I received four different exotic sea salts and a little wooden case to store them in. Last year, I got an assortment of nine peppercorns, ranging from the more common (black pepper) to the most exotic (Sichuan peppercorns) (incidentally, did you know they were banned in the U.S. until fairly recently?). 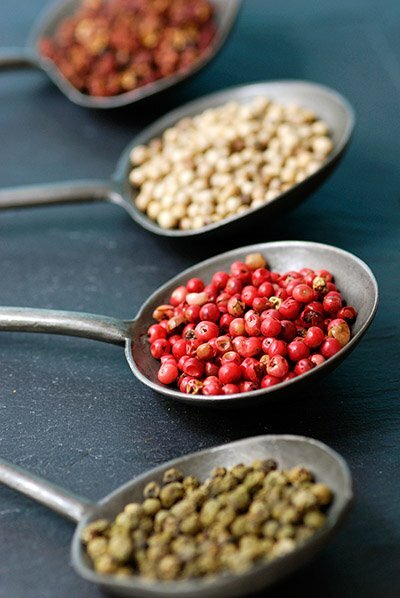 What's one to do with all these wonderful peppercorns? Well, lots of course. And the obvious would be a wonderful peppercorn-encrusted tuna or perhaps a steak with pepper sauce. And then I thought about pepper oil - wouldn't that be neat? But then, of course, flipping through Donna Hay, (and sorry to be boring given that she produced the last recipe too) there it was: salt and pepper lotus chips. If you can find lotus root, you're in business. I managed to find some in the local Japanese grocery store (and of course, got sucked into a cartload of other items while I was there). Then, it's just a matter of slicing them thinly, frying them in some vegetable oil, and tossing them in a wonderfully fragrant spice mixture of salt, Sichuan peppercorns, dried chillies and star anise. They are very beautiful and delicate-looking and they pack quite a punch. P.S. I'm contributing a series of photographic kitchen tours (in Manhattan) to Apartment Therapy's great kitchen-related site, "the kitchn." Check out the first one here. Place the salt, Sichuan peppercorns, dried chillies and star anise in a small frying pan over high heat. Cook, stirring for 2-3 minutes or until aromatic. Remove from the pan, place in a small food processor and process until combined. Set aside. Heat the oil in a large deep saucepan over medium heat until hot (~350 degrees F). 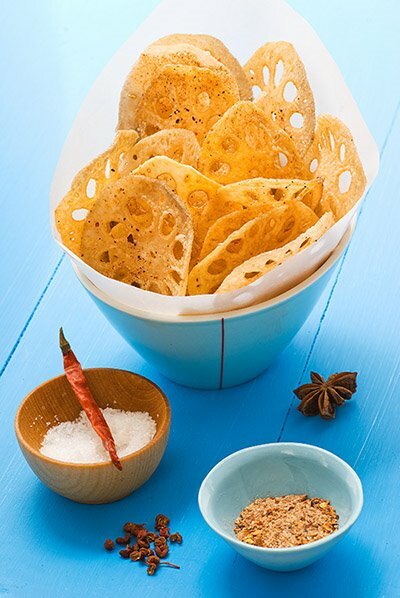 Deep-fry the lotus root slices in batches for 2-3 minutes or until golden and crisp and drain on absorbent paper. Place the chips in a bowl with the salt mixture and toss to coat. Serves 8. I'm submitting my peppercorn photo to this month's "Click" event which has a theme of "metal". Feel free to jump over and vote after all the entries are received on March 30th. Maybe it’s the continuation of winter that’s making me long for crisp, bright vegetables with lots of color. I’m also finding myself cooking simple, quick meals and cutting corners wherever possible. Browsing through Donna Hay’s latest magazine, my exact thoughts were responded to from the other side of the world in the form of a quick, zippy dinner: red curry with tofu. I know tofu is not for everyone. It’s really not the star of this meal anyway. It could easily be omitted or replaced with some sliced chicken or beef sautéed with a little salt and pepper. If the star of this little drama is a flavorful red curry paste and coconut milk sauce, then the unexpected plot twist is how quickly it all comes together. In fact, the first time I made this, I picked up two takeout cartons of jasmine rice from the local Malaysian restaurant and didn’t even make the rice. How long did it take me all together? Ten minutes at most. In a fraction of an hour, we had a spicy, crunchy, (mostly) healthy meal that was incredibly satisfying. Not only is it rather scrumptious, but also it’s quite pretty on the plate. Have a try. I’ve adapted the recipe by adding a trick I learned from Thomas Keller’s tomes: to blanch the vegetables prior to cooking. 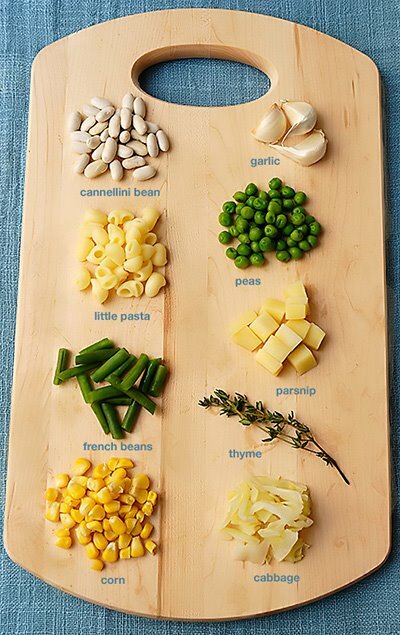 You can certainly skip this step, but it’s what helps the vegetables retain their vibrant color. It’s quick to do, and you can blanch everything ahead of time if you like and the throw everything together in a few minutes when you are ready to cook the meal. Cook onion with 1 tablespoon red curry paste in a little vegetable oil (note: I like to slice the onion in half lengthwise and then slice thinly along the grain). Add 1 cup coconut milk and 2 cups jasmine rice and stir until well combined. Add 200g chopped firm tofu, green beans and red pepper and cook until warmed through. Season with salt to taste. Top with chopped red chili, bean sprouts, mint and scallion. I have a secret to share. I’m not sure why I’ve kept this to myself for so long. 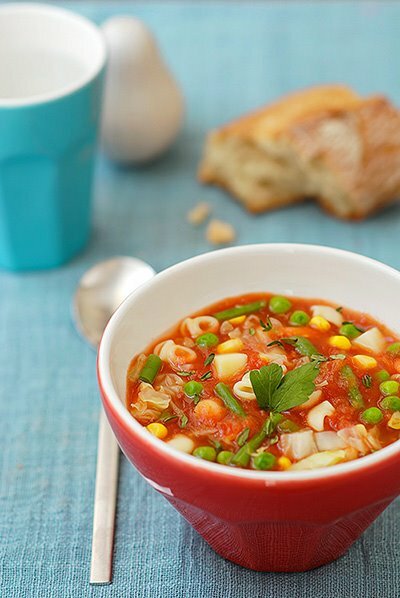 It is the ultimate recipe for warm and hearty minestrone soup. 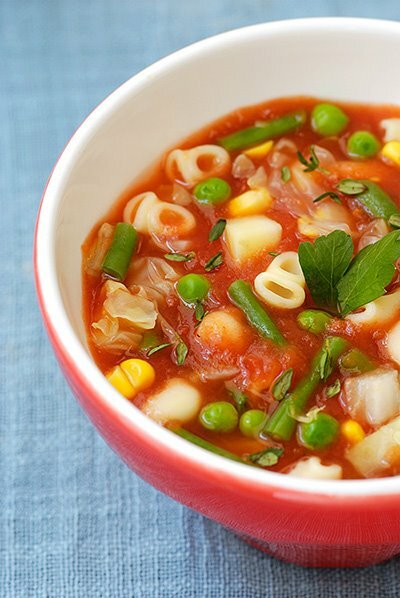 Believe-it-or-not, I’ve been making this one minestrone soup recipe since college. And that, friends, was a long time ago, but we won’t get into that. The recipe comes from my friend Alison, and before that, her dad. Well, actually it comes straight out of Len Deighton’s Cookstrip Cook Book. I have a photocopy of the recipe that is many, many years old, and that I keep in a recipe book with plastic sleeves that I use for hand-written recipes that pre-date the days of electronic bookmarking. Because Wikipedia seemingly has information on everything, I was able to learn a little bit about Len Deighton. Not only is Len Deighton a novelist, but also, among other things, he is an illustrator and wrote and illustrated a weekly cooking comic strip in London's The Observer newspaper called “Len Deighton's Cookstrip.” He also wrote and illustrated a series of cookbooks. What’s great about this recipe is it’s straightforward and unfussy. It’s a bit of a choose your own adventure: there are basic ingredients which form the basis of the soup but you can “add on” whatever you would like. As such, you can have a slightly different soup every time – and it’s always wonderful, flavorful and hearty. I love sweet corn in mine. I always use a large can of crushed tomatoes (slightly higher in quantity than the weight suggested in the recipe) in place of fresh, as it’s simpler and easier to get high quality canned tomatoes year round. This last time, I added cubes of parsnip which were nice. Give it a try! Serve with a sprinkle of chopped parsley. Pass lots of grated parmesan cheese. Ok, so we are all just about fed up with winter and the endless supply of root vegetables we’ve been living off for the past few months. I can’t wait until a trip to the farmer’s market reveals the first peak into the new season. 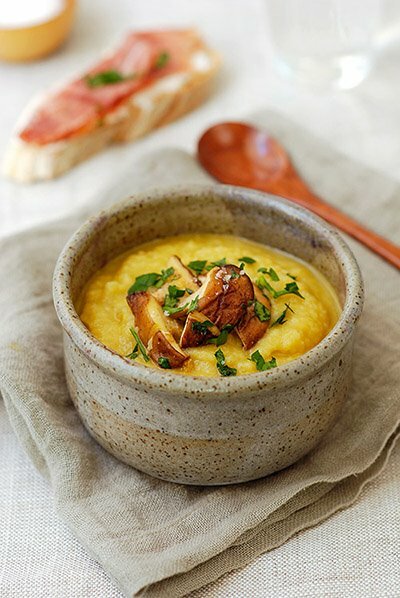 In the meantime, however, it is what it is, and rather than complain, I thought I’d truly embrace the earth’s winter feast by trying La Tartine Gourmande’s recent recipe for Jerusalem artichoke soup. La Tartine Gourmande is one of my very favorite blogs. Bea is a wonderful writer, photographer and enthusiastic cook (and by the way, not only does she publish her recipes in English but she also translates them into French as well). As far as I can tell, everything she touches becomes more beautiful and delicious, and I figured her soup recipe, which is decadently topped with, among other things, a drizzle of truffle oil, would be a safe bet. Of course, no self-respecting food blogger would be content just to leave a recipe well enough alone. Although I’m sure her soup is divine exactly as written, I just couldn't resist fiddling to suit my own preferences. So I made some substitutions: thyme for rosemary, celeriac for fennel, and some additions: garlic in the soup, and sautéed mushrooms for the topping. The result: magnifique! So good, in fact, that R & I ate the entire portion between the two of us in one decadent lunch and then were driven to make the entire thing again a couple days later because we just couldn’t get enough. Jerusalem artichokes (or sunchokes), if you are not familiar with them, are not at all artichokes, but rather the tuber of a flower in the aster family (related to the sunflower). They are readily available in farmer’s markets (or at Whole Foods) at his time of year. Why they are called artichokes (or sunchokes), I have no idea – but probably the same reason that the Patagonian toothfish sells better when called Chilean sea bass. If you haven’t had them, they are like a cross between a potato (the shape and the heartiness), a parsnip (the texture and less starchiness) and an artichoke (a hint of the artichoke’s sweetness and delicate flavor). The soup, with Jerusalem artichokes, celeriac, celery, potato, garlic, truffle oil, and mushrooms sings of the earth’s bounty, and reminds us of all the things that are good about the winter. For Bea’s unadulterated version, see here. Heat 2 tablespoons olive oil in a large heavy bottomed pot (such as a dutch oven). Add the shallot and garlic and cook with the coriander seeds and thyme on medium heat for a few minutes, until shallots and garlic are golden. Add the broth (or water) and bring to a boil. Season with a few generous pinches Kosher salt and freshly ground pepper. Cover and simmer for about 20 min, until the vegetables are fork-tender. While broth and vegetables are simmering, heat one tablespoon olive oil in a small sauté pan and sauté ~1 teaspoon garlic for ~30 seconds. Add mushrooms and ~1 tablespoon chopped parsley and salt and pepper to taste, and sauté for another minute or two. Remove the dutch oven from the heat and use a stick blender to purée (or puree in your food processor). Add the cream and adjust seasonings to taste. 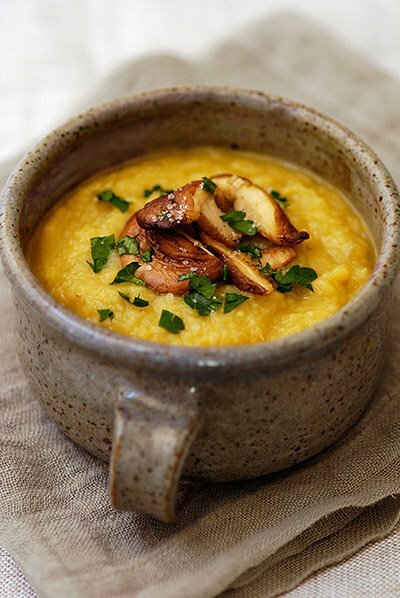 Serve soup topped with a couple tablespoons of the mushroom mixture, and a drizzle of truffle oil, a couple pinches of chopped Italian parsley, and a pinch of fleur de sel.